by Markless™ Astronomics is designed to prevent unintentional unspooling (unwinding) of the ALT drive cable from the ServoCAT ALT drive motor assembly drive wheel. The ServoCAT system cannot be beat, but in practice, if one is not careful when disengaging the ALT drive wheel with the toggle clamp handle, the drive cable can unspool from the drive wheel, necessitating a show-stopping pause and rewinding of the cable. It isn’t hard to rewind, but why not prevent it from unspooling? Cable-Stop™ to the rescue! the stopped lever position permits the OTA to be moved manually without cable drag. Cable-Stop™ is compatible with practically any DE-STA-CO 323-M toggle clamp on any telescope on which it is installed, including Obsession Telescope Classics, Ultra Compacts (UCs), and other Dobs having a ServoCAT installed and using a DE-STA-CO 323-M toggle clamp. Translation: Cable-Stop™ is compatible with your ServoCAT equipped telescope! Installation couldn’t be simpler. Uses the screws already attaching the Toggle Clamp to the telescope. 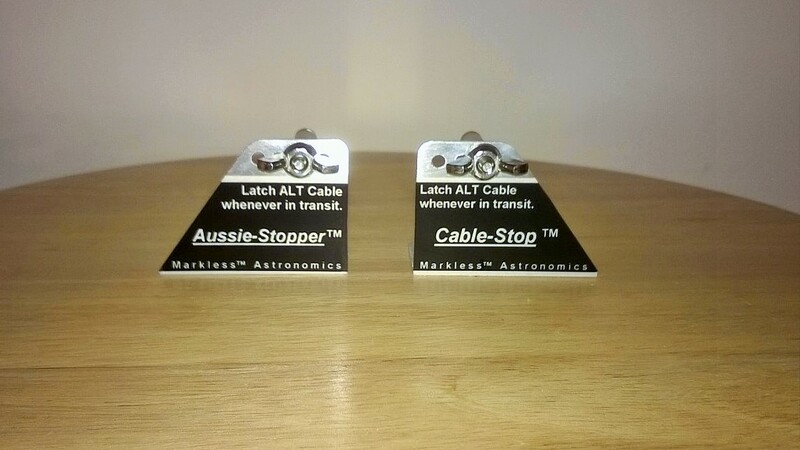 Now available, a Cable-Stop™ for Down-Under telescopes! When the focuser is put on the other (left) side of the telescope and a Servo-CAT is installed, often a reversed ALT Motor Assembly is supplied. When that occurs, the ALT drive wire cable and clamp are installed on the same side as the focuser, and a mirror image Cable-Stop™ is needed. It is called an Aussie-Stopper™. 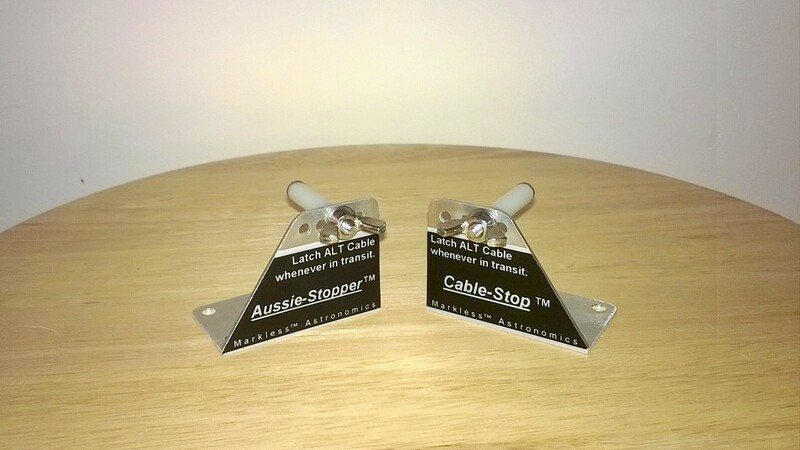 Specify when ordering if you want the Cable-Stop™ or the Aussie-Stopper™. Same low price, 15 plus S&H. Astrocrumb Filter Slides - a "MUST HAVE" accessory for your Big Dob. Roger builds 'em RIGHT!